So, who’s getting the biggest slice of the pie? As budget season approaches I’m doing my mid-year study of marketing data that we collect here at J.C. Hart. In the past I have mentioned how I think it’s important to not just review data month over month, but to also look at it year over year and over a series of years. I typically will look back 4 years and also pull year-to-date numbers to see if we have any trends for the current year as well. What’s most interesting about my analysis this year is that 2007 was the last year before our big shift to online and social media. We’d always had a company website and we’ve listed on numerous ILSs for years, but we really began to shift our marketing investment in 2008. The following data is a summary of all J.C. Hart Apartment Communities leasing records for 1st marketing source cited by a new move-in. Back in 2007 you will see that Print Guide marketing contributed a little over 10% of our leasing, and the ILSs contributed nearly 20%. Unfortunately, nearly 60% of our marketing spend was going to Print Guides and ILSs. At this time, Craigslist was barely a blip on the radar, but we saw the majority of our leases coming from good old Drive By and Referrals. 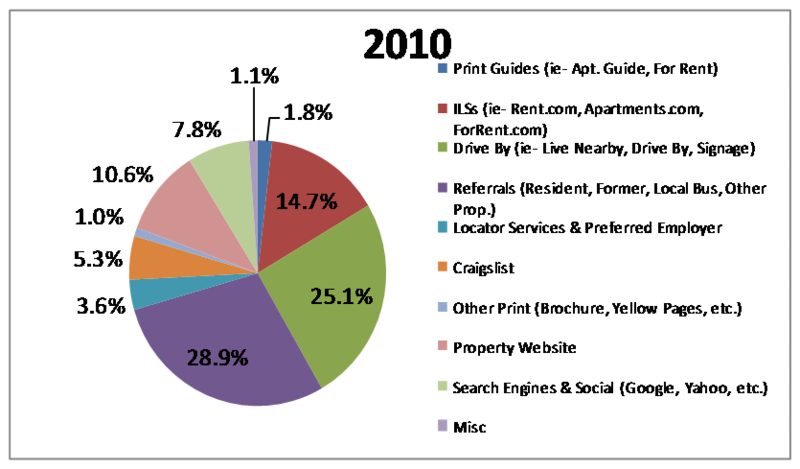 When I looked at these numbers back in 2007 I remember thinking to myself, “Self, why do we spend most of our marketing $ on these sources and nearly nothing on Drive By, Referrals, or our own Property Websites?” It was somewhat of an epiphany for me. What else could we do with that money? We did have property websites in 2007 (that I thought were great at the time), but they were only cited by 1.4% of our new move-ins. Something definitely needed to be done there. Bottom line, the spend seemed oddly weighted, and I knew there had to be a better way. So onward we went into 2008 with a new plan. That plan included dropping one print source and reinvesting about 50% of that savings into: beginning a new website initiative, starting to use Google Adwords, and the beginning of our strategy to incorporate social media into our marketing. In addition, we launched test properties using a revenue management system for our pricing. It was kind of amazing what else we could do with those dollars. The shift wasn’t dramatic, but we began to see our Property Websites and Referrals make up for the downward trending Print Guides. In 2009 the real shift happened. 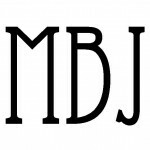 We saw our Property Websites completely cover and take over for what was once attributed to print for our leases. We had dropped another Print Guide that year and invested into more website tools, more social media efforts, more Adwords, began some basic strategy Craigslist posting, and we also added some additional ILS listings we had not previously been in. Our Property Website leases jumped from 5.7% to 10.6% of the marketing sources, Referrals 24.7% to 26.9%, and ILSs 16.2% to 17.7%. And then just last year in 2010 we began to reduce our spend with ILSs and adopted a strategist Craigslist plan using the RentSentinel Marketer tool. All-the-while investing more into social media as well. So the shift had happened. 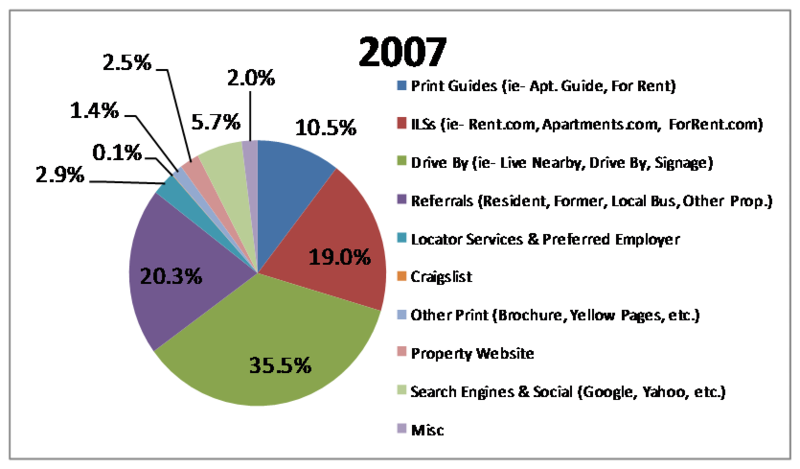 That 10.5% of leases attributed to Print Guides in 2007 was now all covered by our Property Websites, and the ILS cited leases went from 19% in 2007 to 14.7% but were easily covered by our Craigslist efforts. I did make the assumption that being in the Print Guides did help drive traffic to the correlating ILSs as well back in 2007, so I do not conclude that the effectiveness of an ILS has gone down. However, even though all is not necessarily equal, I also do not conclude that the ILSs have necessary improved in driving leases over the past 4 years either. Of all the numbers, the one I am watching the closest is the Referrals. Up from 20.3% of the leases in 2007 to 28.9% in 2010. While we may have traded leases with our improved website and by having a better Craigslist strategy, the Referral number is something I know our company is proud of. We’ve built a company and communities that others want to share and talk about. As I see our Google Analytics traffic report more an more traffic from Facebook and Twitter, I can only imagine how the power of social media has impacted this number directly or indirectly as well. The power of sharing online and getting referrals is something I feel is critical to a company’s marketing. This helped offset the reduced Drive By citings in our records, and we couldn’t be happier to see that. The trend so far in 2011 is definitely shaping up to be interesting as well. ILSs continue to decrease as a result of us dropping Rent.com’s services, but our Property Websites are trending up to 13.7% from 10.6% and Search Engines as sources in general have gone up from 7.8% to 10.4% of the mix. Those are definitely numbers I’m watching as our website traffic increase year over year correlates to this statistic. Obviously there is more than one way to skin a cat. What I think is most important to point out here is the continued increase in the Property Website category, and why social media, search engine optimization, and online marketing in general can be huge factors to lead people where you want them to find you. Your Property Website should be the best way for people to learn about your communities and what you have to offer, and I truly believe that your marketing investments should target areas to help drive people there. If you would like ideas for how you can shift your marketing and build a better online strategy I’d love to help. Please let me know.